The truth is I have never been asked out on a date in my life. Not ever. Don’t feel too bad. It’s just not a question that existed in our Dutch vocabulary ten years ago – when I was datable. ‘We really should go see it before it leaves town.’ Subtle opportunity presents itself. Leave it to us Dutch to deal with that. ‘Sounds like a plan! See you there’, will set the stage. In those days movies only played in one location at the time. That was helpful. All you had to do is get on your bike on Sunday. No pressure. Not a word exchanged about the definition of the encounter. Who is dating who? Are two friends just getting together? Who knows? You each pay your own way so who CARES??!! ‘What church does she belong to?’ Easy as pie. No harm done. God loves New Yorkers. How do I know? Well, you don’t think any of us REALLY know how to install an airconditioner, do you? I know for a fact non of us do. Yet we all need one. Or two. And sure, we try our best to get it right. We know it is a mighty heavy object to have land on your head – if it ever did decide to drop down. New Yorkers have a strong sense of responsability when it comes to the well-being of their fellow men. So we try to buy an airconditioner that fits the window perfectly. We don’t mind spending a little extra. But even if our tape measure said it did fit, in the end, it never does. So we call our super to the rescue. He tries to be helpful attaching some pieces of wood for extra support. We still have our doubts but we can’t think of any other option than to just hope for the best. We even say a prayer. And the prayer seems to work! I have never heard of an airconditioner-related accident. We have been known to slip and end up on the subway tracks, walk under buses, and fall into potholes. But when it comes to air conditioners, we New Yorkers seem to have a little guardian angel watching over all of us. Thank God! I don’t even want to think of the consequences should something like ever happen to me. As you can see, it’s a work in progress. 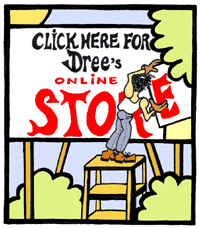 Soon you’ll be able to read my comic strip Dree in the Big Apple – New York adventures as experienced and seen through my European eyes. I’ll share my love for this city and its residents, my thoughts on food (Iâ€™m a passionate vegan chef so there will be some yummy recipes to check out too! ), and some â€˜food for thoughtâ€™ â€“ stuff I think is worth thinking about. For now, do check out the documentary films and ceramics of a Dutch girl living and working in Amsterdam and New York!